Cedar Mountain has more than 35 years of excellent service in Spokane, WA. We have been assembling spa covers by hand, and each one is subject to a stringent inspection, so that you are sure to be provided with the best possible quality hot tub product. In addition to a great product, Cedar Mountain provides unsurpassed customer service. 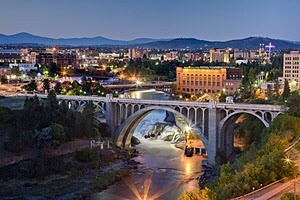 Spokane was established in 1872, and was known at that time as: “Spokane Falls”. Did you know that Spokane means “Children of the Sun”. 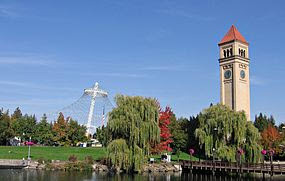 Other fun facts about Spokane include the fact, that they hosted the World’s Fair in 1974, and it is the birthplace of Bing Crosby. There are over 20 wineries in and around the Spokane area, including the “Barrister Winery” and the “Townshend Cellar”. The Centennial Trial is available for walkers, runners, and cyclists to enjoy. This 37 mile path extends from the state line of Idaho, to Nine Mile Falls in Washington. The Art Deco Fox Theater is one of the more than 50% of the buildings in downtown Spokane that are part of the Historic Register. Within a 60 minute drive, residents of Spokane have access to more than 75 lakes, including the spectacular “Lake Coeur d’Alene”. In addition, there are more than 30 golf courses available, for players of all levels, and there are also five major parks to be enjoyed by everyone. Golf Digest has described Spokane, as the “golf mecca” of the region. The Grand Coulee Dam is a great attraction, and also just a short car ride from the city. Spokane is located just 18 miles from the border of Idaho, less than 300 miles from Seattle, WA, and just over 100 miles from southern Canada. More than 204,000 people call Spokane their home. The average high temperature is in the mid 80’s, and winter months may drop into the 30’s or below. On average, Spokane gets less than 18 inches of rain fall yearly. Residents can enjoy about 175 bright sunny days a year. The city sits between the Rocky Mountains and the Cascades Range. This location protects the area from severe weather that may affect other areas of the Pacific Northwest. The mountains form a natural protective barrier around Spokane. There are over 150 Cedar Mountain dealers available nationwide, for your convenience. Simply visit the dealer locator in order to find a friendly dealer who offers our spa covers for sale in Spokane County. 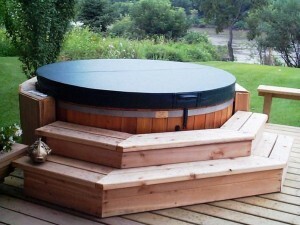 To find out more information about how to become a spa cover dealer near Spokane, WA, simply fill out this form. If you have any questions, please call: 208-772-9176.